Our team specializes in publication design. And as a result, we produce great results at a reasonable cost, appropriate for nonprofit budgets. The MillerCox team has put hundreds of publications on press. Throughout the years, we have worked with a wide variety of nonprofits, think tanks, universities, associations, and mission-driven entrepreneurs to create visually engaging and thoughtfully designed annual reports, policy papers, catalogs, evergreen brochures, and special reports, all of which are designed to support overarching goals of nonprofits. Before we begin work on your publication, we develop price estimates, key deliverables, and schedules. A great way to refresh your branded materials is to get fresh (and expert) eyes on your communication materials. We work to clearly understand your mission, vision and core values and strategize with you about how to share these guiding principals with your supporters and donors in a credible, engaging and persuasive manner, online and offline. 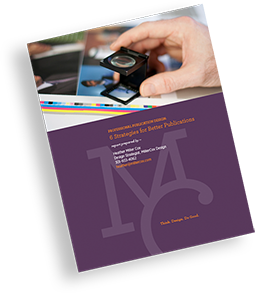 We support in-house teams as well, to help to unify the look of your printed publications, collateral and digital presence so that you can speak from one, consistent visual voice. If you don’t have an in-house team, we can work with you to bring all of your materials into alignment. Once our initial review is complete, we present our recommendations, taking into consideration the branding you already have in place online and offline. When appropriate, we suggest how you can weave in stories of your impact with your mission and core values, and outline how to use digital and social channels along with your printed publications to reach the right audience. Our goal is to enhance your mission’s brand voice and lay a foundation for higher donations, more positive media attention, and increased organizational support. If you have been wondering how to take your printed publications to the digital space, in the form of interactive PDFs, epubs and iPad apps, we can help. Just give us a ring and we can figure out which format makes the most sense for your publication. (301) 933-4062.